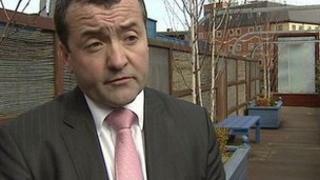 Image caption Declan Gormley sued Sinn Fein and two of its representatives. Declan Gormley sued the party over the contents of two press releases it issued in 2011 in support of his sacking from the NI Water board. The party denied the press releases were defamatory, but on Friday a jury found it had acted with malice. On Monday, the jury at Belfast High Court decided on the size of the damages. Mr Gormley will also receive full costs. Speaking outside the Court he insisted the case was never about the money. "I'm absolutely delighted, but I think it's more important to point out that this completes the utter vindication of my position," he said. "What happened to me was wrong, a jury of ordinary men and women have decided it was wrong and have awarded accordingly." Mr Gormley was sacked along with three other non-executive directors from NI Water in March 2010. Then Regional Development Minister Conor Murphy removed them from the board following an independent review team investigation into the awarding of contracts. A subsequent Stormont Public Accounts Committee report into procurement and performance at the company was said to have criticised the earlier inquiry and questioned its independence. Mr Gormley emphatically denied any wrongdoing. He issued libel proceedings against Sinn Fein and two of its representatives, MLA Cathal Boylan and former Assemblyman Willie Clarke, over the contents of press releases backing the decision to sack him. Over the course of a 10-day hearing at the High Court in Belfast, his legal team claimed they damaged his reputation and were reckless, if not dishonest. Lawyers for Sinn Fein contended, however, that neither statement contained any defamatory content. They also claimed a defence of qualified privilege, arguing that the press releases were in response to a campaign of attacks on Mr Murphy mounted by the SDLP with Mr Gormley's collusion. But a jury of five men and one woman found for Mr Gormley on the balance of probabilities. They decided that both statements were defamatory and that the defendants were guilty of malice. Mr Justice Gillen then rejected a final defence of qualified journalism, ruling that no steps had been taken to try to verify the contents of the press releases before publishing them.